Today's post comes from my friend Simon. In addition to be my favorite Australian, he's lead singer for Blunt Lancet. Simon blogs at Simon From the 70s, and tweets too. In my younger years I was quite the fisherman, well at least that's what I convinced myself. The average day would begin full of optimism as I prepared my gear in the back shed. Arriving at the jetty, I would cast my line in along with the other punters and try my luck. No matter what the day yielded, it always ended with tales of regret, of the one that got away, of opportunities lost and what might have been. It seems so much of my life with diabetes has mirrored those fishing expeditions. I'd set out each day full of optimism and hope; I would get my boluses spot on, I'd correct any pesky highs and test diligently to male sure I was in range, only to stare despairingly at my glucometer by days end, revealing another tale of woe. 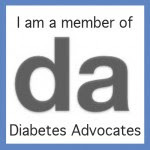 Today just as in days of old, I'll toss my line in the waters of diabetic life afresh. I'll set out with the same optimism, hoping for the best but expecting the worst. By days end there will be more tales of regret and missed opportunities but now the pain is shared as I cast in my lot with a group of people I am honored to call friends. Somehow in their company, I can bear the failure that once shattered me and find the courage to bait up for another day. Thanks, Simon! Life with D is much better with the DOC at your side! Wonderful post Simon! Loved catching your guest post on Mike's site the other day, and great seeing you here! So true that while we have the best intentions, things can still go awry. That is "D" in a nutshell. Beautiful post. What an awesome metaphoric post, Simon! Thanks for sharing your experiences here (a day after guesting for me, I might gratefully add!). Good stuff.